From the moment CBS announced that Stephen Colbert would take over David Letterman's spot as the new host of The Late Show, I knew that this was one of the best decisions the network has ever made. But then the questions began, what version of Stephen Colbert will we see? What would he bring to the long-running talk show? In Colbert's first monologue on The Late Show host, we saw precisely what he will bring to his new reign: His pure, comedically genius, joyful self. There have been mixed emotions about seeing Colbert's true personality rather than his Colbert Report persona, but after actually watching it on Tuesday night's Late Show with Stephen Colbert's series premiere, it is an amazing sight to see. Colbert seemed so happy and grateful for the new gig, but also had no problem poking fun at himself, the new show, and his new network. Colbert began his monologue after a wonderfully happy and music-filled entrance complete with some classic Colbert dance moves, as his audience chanted "Stephen" just like on his old show. He then addressed the audience and viewers at home as "Nation," before snapping out of it and saying that he had no idea what that means. Colbert then began talking about how he and his staff have prepared for his new show, saying how if he knew that waiting nine months to do one show was an option, he'd do it all the time. Colbert then thanked CBS for letting him take the time to get ready for his show, stating that the network played reruns of The Mentalist. 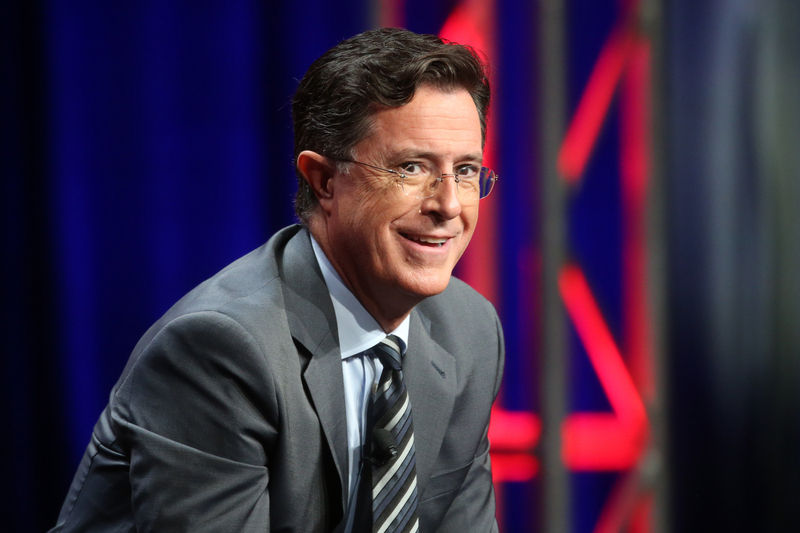 "You know, the show about the Australian man who solves cases with his dimples," Colbert said. The comedian then introduced the president of CBS sitting in his audience, Les Moonves. When the camera cut to Moonves, he was sitting in a chair with a lever that said Late Show on one side and The Mentalist on the other. When Colbert asked why Moonves had the lever, the CEO told Colbert not to worry about it. But of course, seconds later, Moonves pulled the lever to The Mentalist and the show cut to a scene from the crime procedural. It was moments like this, where trademark hilarity and weirdness meet, that make Colbert so wonderfully iconic. There's no way this guy won't succeed in his new role as the Late Show host and I can't wait to see how high he flies.